One of our rules during family travel is that we skip the national chain restaurants and enjoy small, local favorite restaurants at our destinations instead. 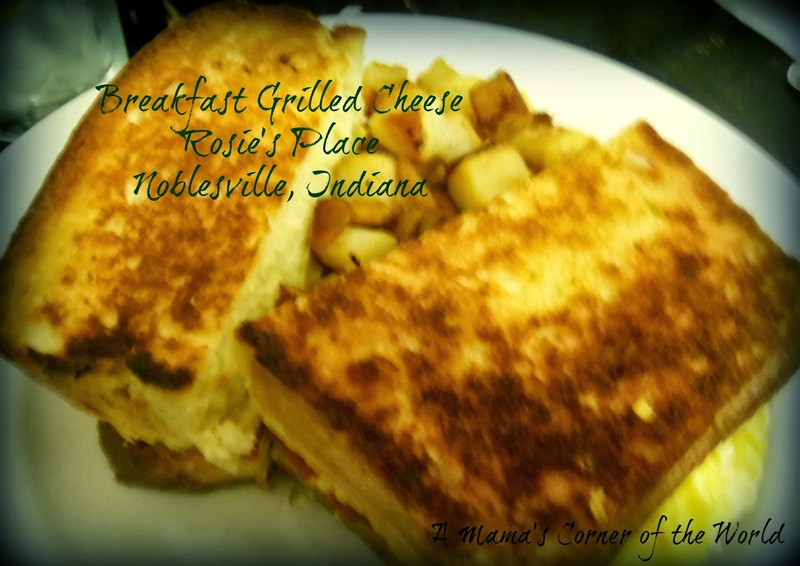 We recently visited Rosie’s Place in historic Noblesville, Indiana, a northern suburb of Indianapolis, during a family blog tour with the Hamilton County Visitors and Convention Bureau. 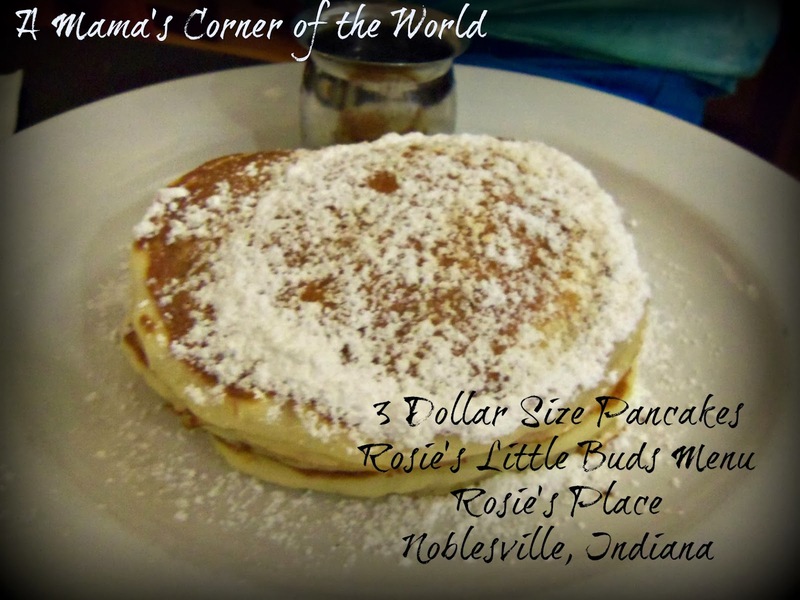 How did Rosie’s Place stand up to our family’s review? Rosie’s Place has a great location. 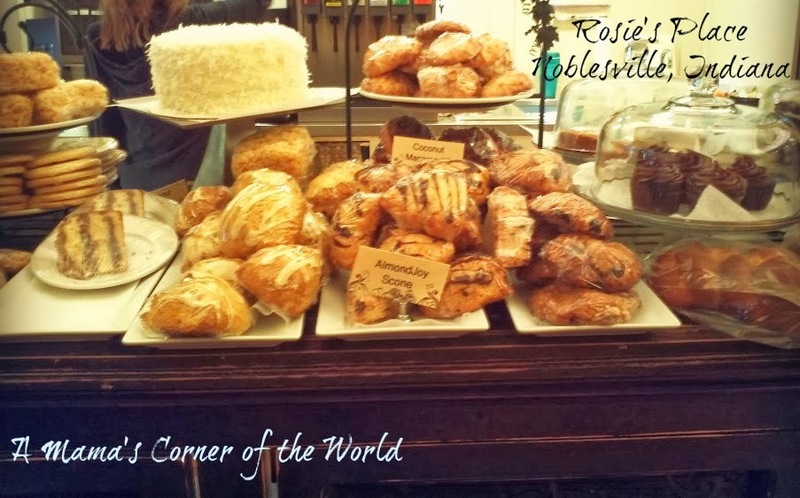 Noblesville, Indiana, has a beautiful, downtown, historic district—and Rosie’s has its place in the heart of the downtown square. We were able to add our names to the waiting list (which you can expect in the popular, breakfast/lunch spot) and wander through a nearby antique shop while waiting. Rosie’s has made great use of an old building—and, even left the wood floors and some of the original brick exposed throughout the restaurant. The streets were busy—and we had to revisit some nearly forgotten, parallel parking skills to snag a space a short walk from the restaurant and the easier, pull-in parking. 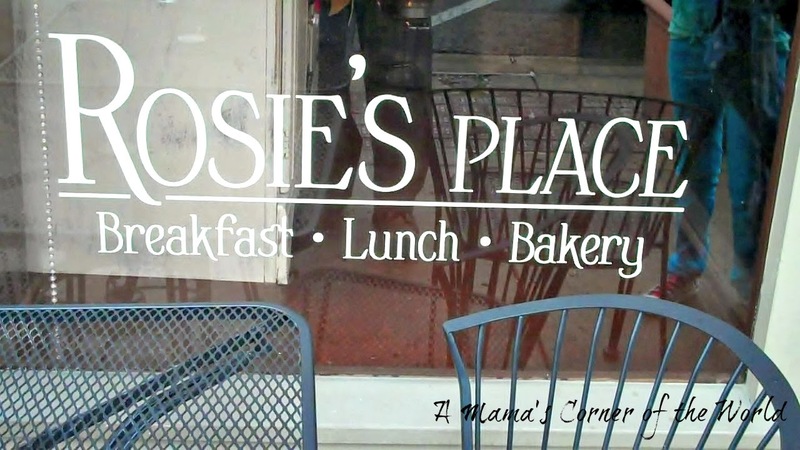 Okay—how was the food at Rosie's Place? I was originally concerned since I hadn't noticed a children’s menu online—but, the server quickly produced two Rosie’s Little Bud’s coloring menus for the girls. 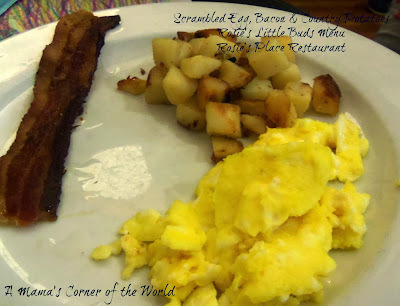 (As a parent, although my children are well behaved and will eat non-kid-friendly foods, I sometimes gauge the family-appropriateness of the atmosphere by the presence of a kid's menu when we travel.) Although, it was technically lunch time and we had eaten breakfast at our hotel—we found ourselves gravitating toward the breakfast specials and meals. The girls ordered from the Rosie’s Little Bud’s Menu.. The Scrambled Egg, Bacon and Country Potatoes were also just what the youngest wanted. Scrambled eggs and a blend of cheeses, grilled between thick slices of challah bread....It was great, but I had to share so that I was able to sample some of my husband's lunch! 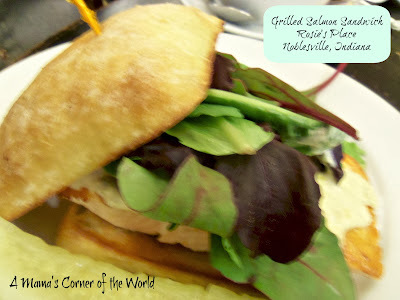 The husband broke the breakfast cycle and ordered a Grilled Salmon Sandwich…. 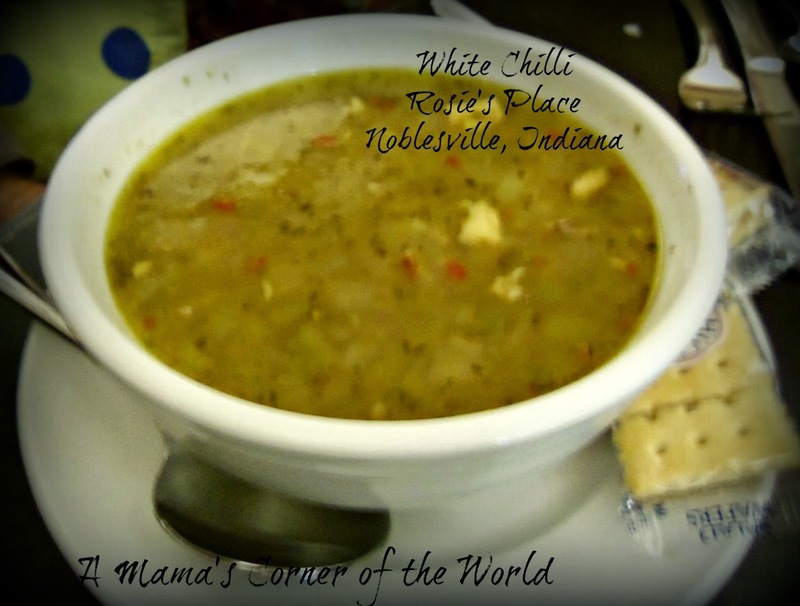 The white chicken chilli was the soup of the day--and he couldn't resist. While he wasn't willing to share half of the chilli, I did get a taste and it was very good! Every dish was prepared very well and our server was very fast and friendly. We were able to combine our meal check with our bakery purchase (a giant Rice Krispie treat, a huge peanut butter cookie and a fudge brownie) for an easy payment process. Would we recommend Rosie’s Place in Noblesville, Indiana? We all enjoyed the food, the atmosphere and the surrounding town square. It was perfectly suitable for kids—and if the kid’s menu doesn’t have enough options, the regular meal portions are certainly large enough for the kiddos to share. I did notice that Rosie's Place offers a mail order baked goods service....I think I may add a tin of peanut butter cookies to my Christmas list! 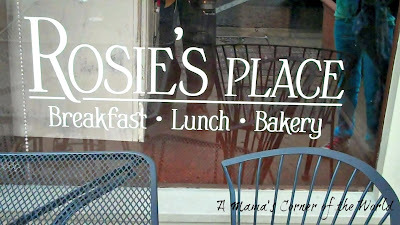 Disclosure: We visited Rosie's Place during a sponsored family travel blog tour hosted by the Hamilton County Visitors and Convention Bureau. All opinions are our own.